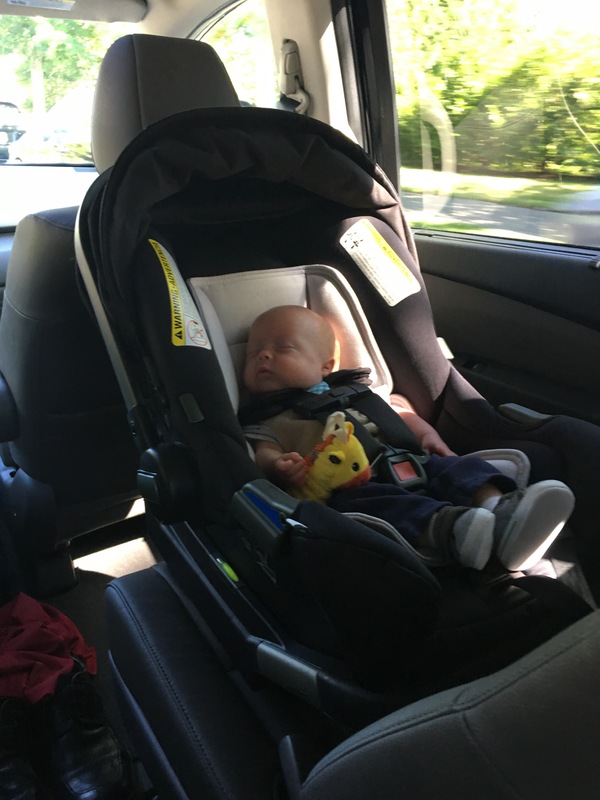 NICU day 98 – HOME. I never thought this day would come, but we are home. After E’s weight loss last night, they decided to check his weight again this morning. With his good feed volumes, a loss just didn’t make a lot of sense. Whether he managed to gain between last night and this morning or last night’s weight was off, he somehow managed to be up 22 grams this morning. So around 6 a.m. we got the official word from the doctor: we were free to go. D came home and then I took him to work and T to daycare, and then I came back home to clean and get a few other things wrapped up. 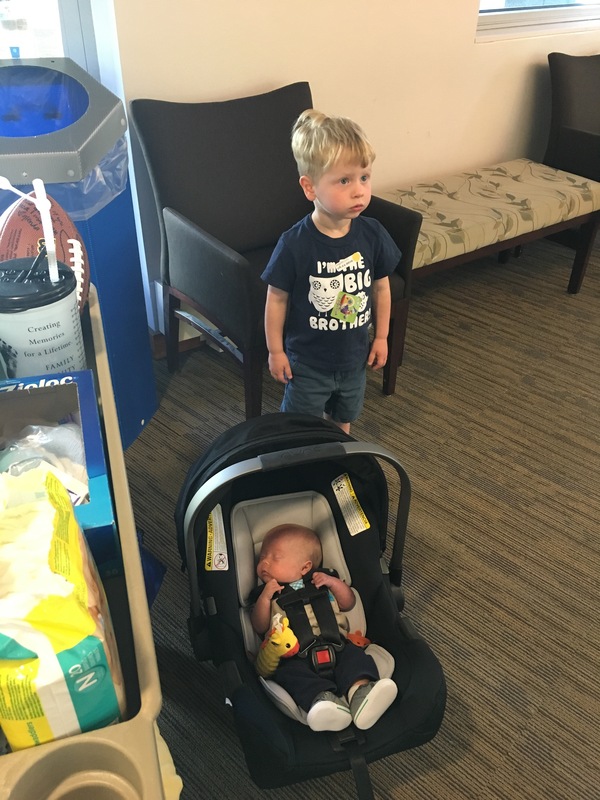 I spent the afternoon at the hospital, talked to the nurses and doctors (there were many tears involved), took some pictures, signed some papers, and then I went to go pick up D from work, and T from daycare (after nap), so we could all go back to the hospital and take E home as a family. It was an incredibly emotional experience. It’s funny, everyone says the NICU days feel long while you’re there, but after you leave they feel like a distant memory. I couldn’t have understood while we were in the thick of things, but we’ve only been home about six hours and already I’m starting to see how that could be true. In many ways it feels like a bad dream that I just finally woke up from. A final quiet moment in the hospital. Headed home as a family of four! We’re still here. We got news this morning that they would like to keep us another day to make sure we are set up for success on the eating front. But we were told if things went well today we could go home tomorrow! E had good feed volumes today, and I spent all day frantically tying up loose ends with work. I got to the bottom of my inbox and conquered my to-do list, checking off what I could, delegating what I couldn’t, and creating a comprehensive hand-off sheet for the contractor we’re bringing in to fill in for me. I also spent all evening doing laundry, cleaning and getting the house ready. After feeling a little panicked yesterday, like I had too much left to do, I actually feel really prepared now. And then D texted me from the hospital tonight and said E lost 22 grams at his weight check. Eff. We won’t get the official word from the doctor until tomorrow morning, but I have a feeling they’re going to keep us another day. There is a good possibility we are going home tomorrow. Emmett continued to average around 80 percent of his feed volume throughout the day, and even took 50 ml via breast this evening, which is better than he’s done at the breast in over a week. He did lose 4 grams tonight, though, so I’m not sure if that will prevent us from going home. The nurse tonight said they don’t count 4 grams as a loss and would label it no change, but she also didn’t seem to be aware of our potential discharge tomorrow, and she thought he was still on scheduled feedings. She also tried to get me to breastfeed when he was just calmly staring up at me and showing no hunger cues and had just eaten an hour before. I’ve never seen this nurse before and I must say I’m not impressed. She doesn’t seem like she knows what’s going on at all. Thankfully at this stage in the game, the nurses aren’t as critical anymore so I’ll just wait until I see the doctor or until the day nurse comes around 7 a.m. to figure out what’s next. 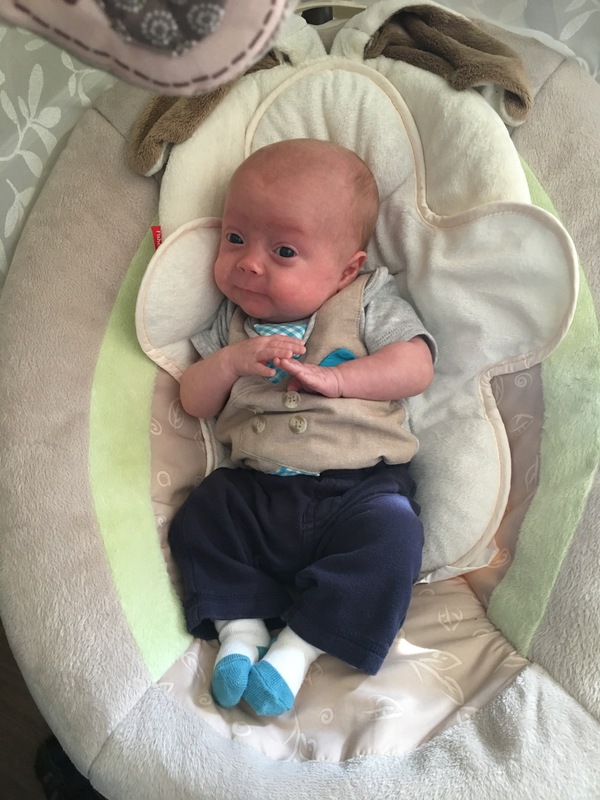 I will admit, I legitimately freaked out this evening after I got home from work, realizing that we could potentially have Emmett home this time tomorrow and I still haven’t installed the car seat base or even thought about a going home outfit for him yet. I also still feel like I have a million loose ends I need to wrap up at work and a ton of chores around the house I had hoped to finish before we bring him home. Amazing how I’ve had three months to prepare for this and it’s suddenly crept up and I have nothing finished. As much as I want him home, I would probably be okay if they wanted to hold us for just one more day! Note: I was just notified by my mom via text message that I did not post this last night. Oops! Lots of good news below, and this morning we just got the even better news that if the next 24 hours go as well as the previous, we can go home! Here’s the rest of what I wrote last night. It’s been more than 24 hours on the no feeding tube trial and we’re doing well. E ended the day around 85 percent of feed volume and managed to gain 44 grams tonight, so that’s a huge win. He’s now 7 lbs 13.5 oz. I haven’t nursed him since yesterday, as I was gone for several hours today and he was sleepy the times I was there, so he’s just been getting pumped milk from a bottle. I feel like a little bit of a failure that I can’t seem to give him those numbers when I’m nursing, but I’m still determined to keep working on this. I know preemie moms who have left the hospital on bottles and fought their way back to breastfeeding and went on to have a successful time nursing. So it can be done. The most important thing is that he is eating, and minus the feeding tube. If he keeps this up we could be home very soon. Well, we’re doing another trial off the feeding tube. We aren’t quite at 80 percent due to the nurse gavaging him twice overnight (though if you ask me, sometimes I think they just gavage him when he could possibly wake up and eat), but he’s had several full feeds in the last couple days and when he pulled his feeding tube out again today the doctor suggested we just not put it back and see what happens again. 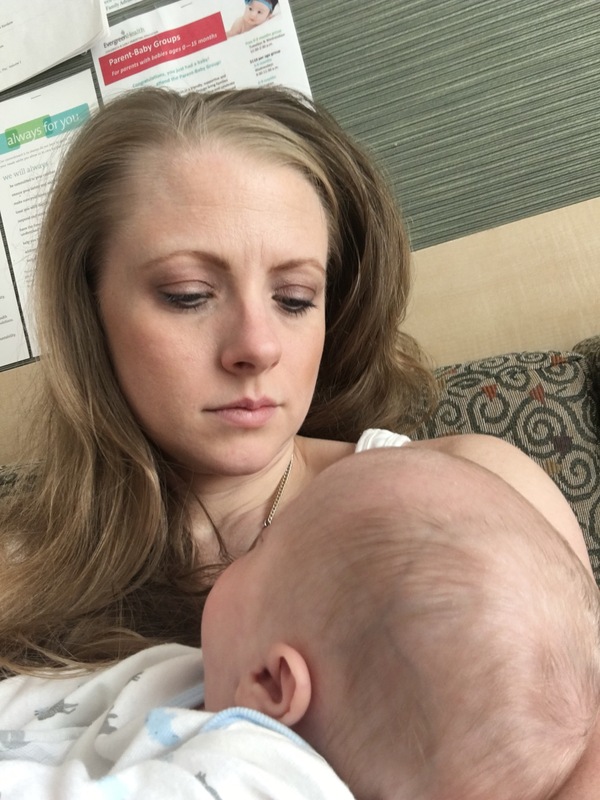 This time around, the doctor suggested that we just do one or two breastfeeding sessions per day and make sure he is really awake, and bottle feed the rest. 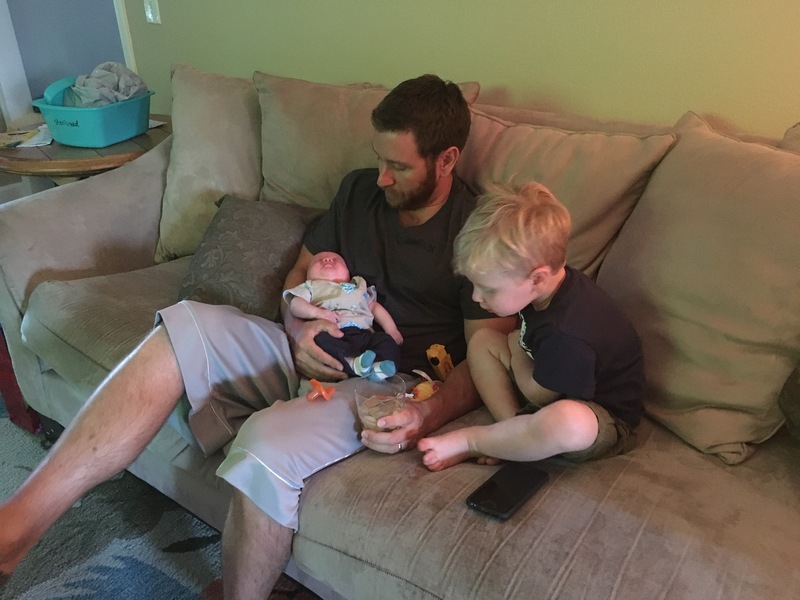 She thinks the one or two breastfeeds per day will give him the practice he needs so he doesn’t lose the skill, while allowing him to conserve some of his energy since he doesn’t have to work as hard for a bottle. 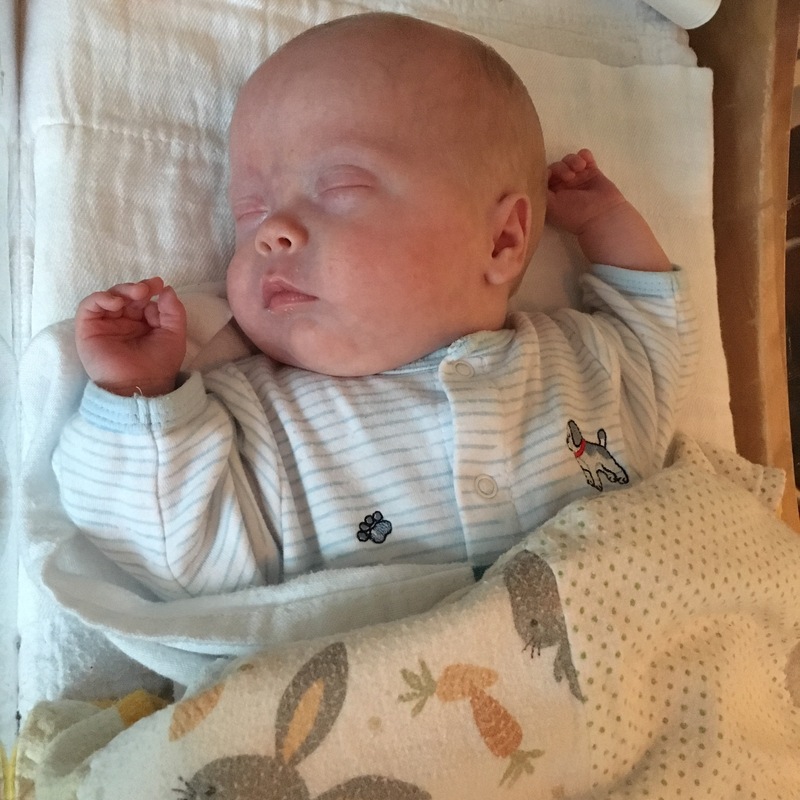 We can work on gradually increasing the number of nursing sessions per day at home, but as long as we can maintain volume, the doctor said she sees no reason we need to stay here any longer. The next 48 hours will be very telling; we’ll either go home or go back on the feeding tube. I spent most of the day at the hospital today, and went home late afternoon, and then D and I went out to dinner and a movie (T is with grandparents for the night). Then I came back to the hospital for the night. When I got here, E was wide awake and happy and the nurse reported he had taken two full bottles while I was gone. He then nursed and got about half of his feed volume from me, which is better than average. 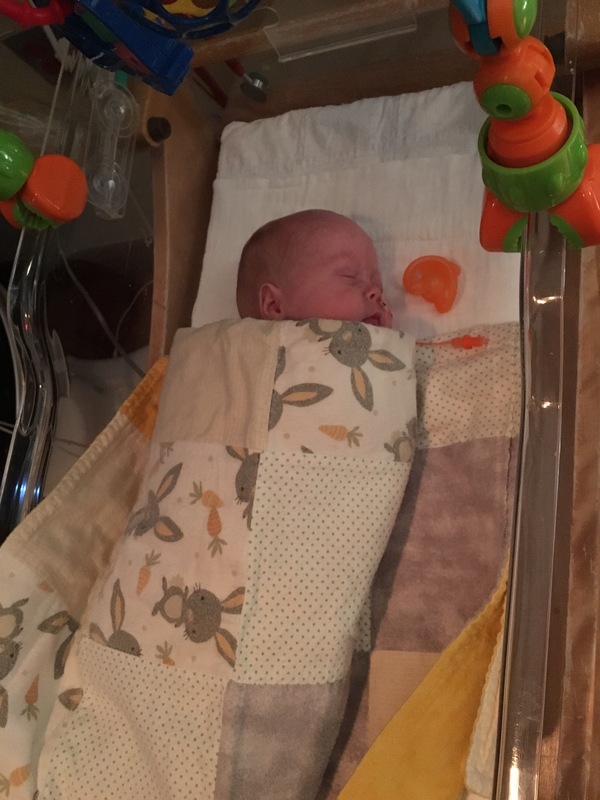 Since we aren’t gavaging after nursing now, the hope is that he can self-regulate and wake up again if he gets hungry sooner, or possibly take a bigger feed next time. I really hope this works, though I’m trying to be realistic since we’ve been through this before. E had a good feeding day today. He hasn’t had to be straight gavaged since 3 p.m. yesterday and he took several full bottles today. I went into the office so I didn’t get to nurse him until 9 p.m. this evening, but he took about a half feed from me, which isn’t terrible. He definitely does better with the bottles. We ended our day at 72 percent of all feeds orally, which is great! Of course, since I’ll be here tonight and most of tomorrow, the breastfeeding will bring down our average. The analytical side of me hates to see those numbers plummet on a day where I nurse more than bottle feed, but the side of me that really wants breastfeeding to work wants to practice at every chance we get. Conflicting emotions, for sure. 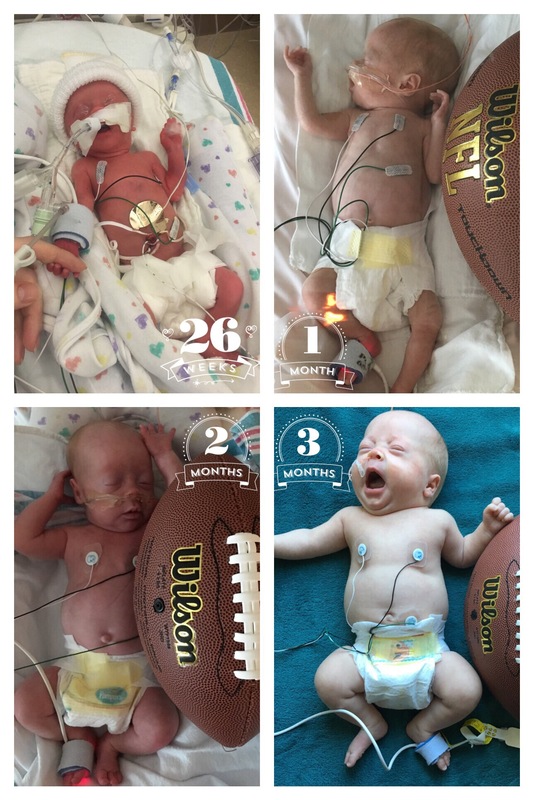 I had really hoped we’d be out of the NICU by the time his three-month birthday came. But here we are. Actually, we had a really interesting conversation with Dr. L today at rounds. 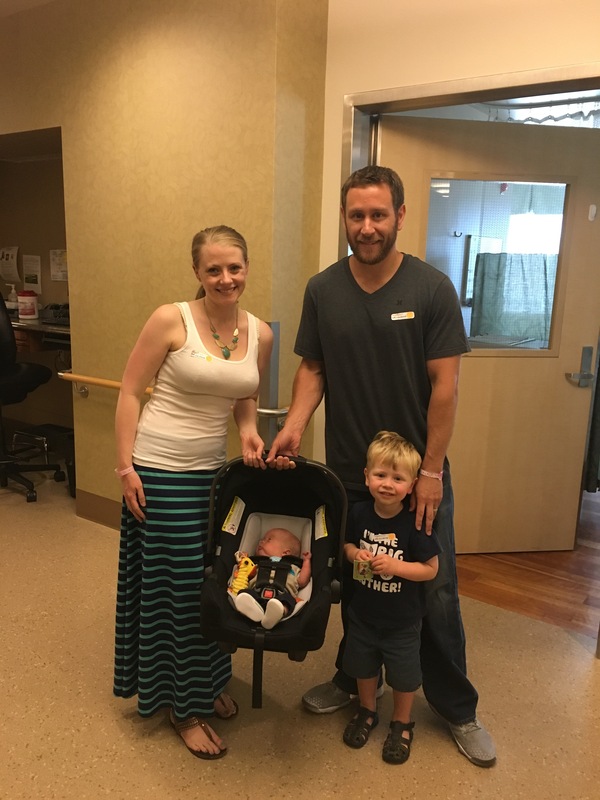 He asked us if we were tired of being here (duh) and said while they don’t like to do this, if we were interested, we could learn how to insert a feeding tube and we could go home on the NG tube while we continued to work on feeding. I was shocked. He was basically putting the decision in our hands when to go home. I feel really conflicted. I want him home so bad. But I want him home healthy. 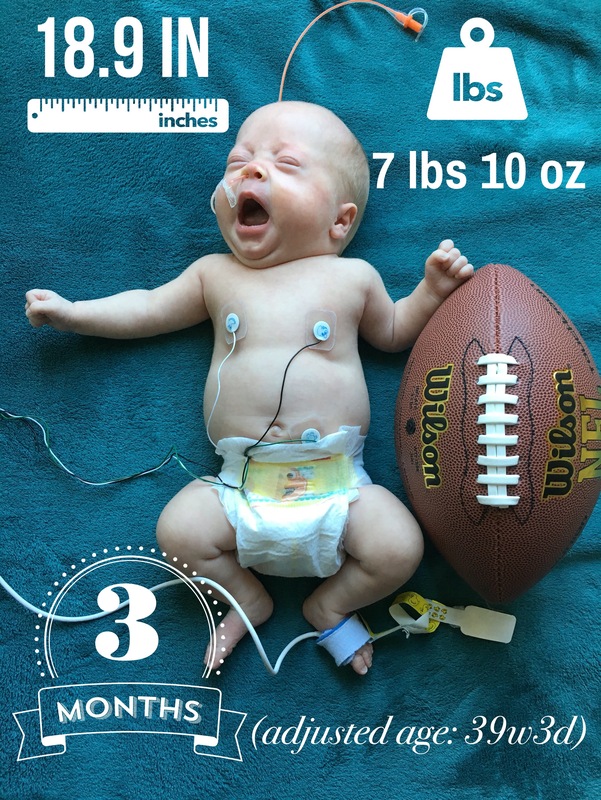 And bringing him home on a feeding tube would mean multiple follow-ups with specialists, possible g-tube surgery, and the intimidating chore of changing his tube ourselves (which comes with the risk of accidentally inserting it into his lungs instead of his stomach – yikes.) It would be one thing if we were facing a long-term feeding issue. But all the doctors and nurses say this is textbook for an early preemie and that he’ll grow out of it. He just needs time. I just wish I knew how much time we were looking at. Another week, two weeks? Let’s wait it out and bring him home wireless. Another month, two months? Let’s just get him home already and stop wasting time in the hospital. So after talking it over with D and the rest of the medical team, I think we have a plan: give him until 42 weeks gestation (he’ll be 40 weeks on Monday) to lose the tube. 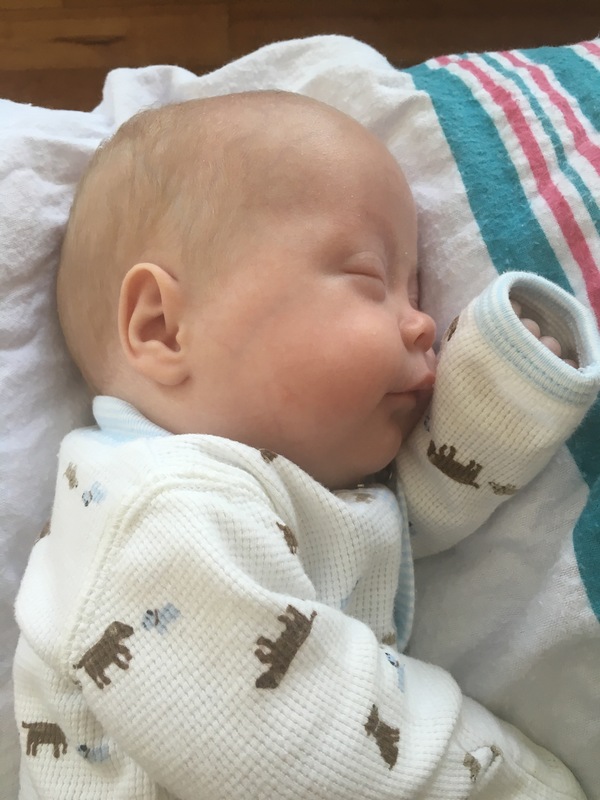 His team thinks he’ll probably figure it out before then anyway, but if not, we’ll bring him home with a feeding tube at 42 weeks. If nothing else, it’s nice to have a hard stop. Feeds went okay today. He’s taken more feeds by gavage than usual (three today, compared to his usual one a day), but the feeds he has done have been nearly full volume. It seems whether he takes a half feed every time or a full feed every other time, he’s still stuck at around 50-60 percent of his volume orally right now. Stats: 7 lbs 10 oz and 18.9 inches. 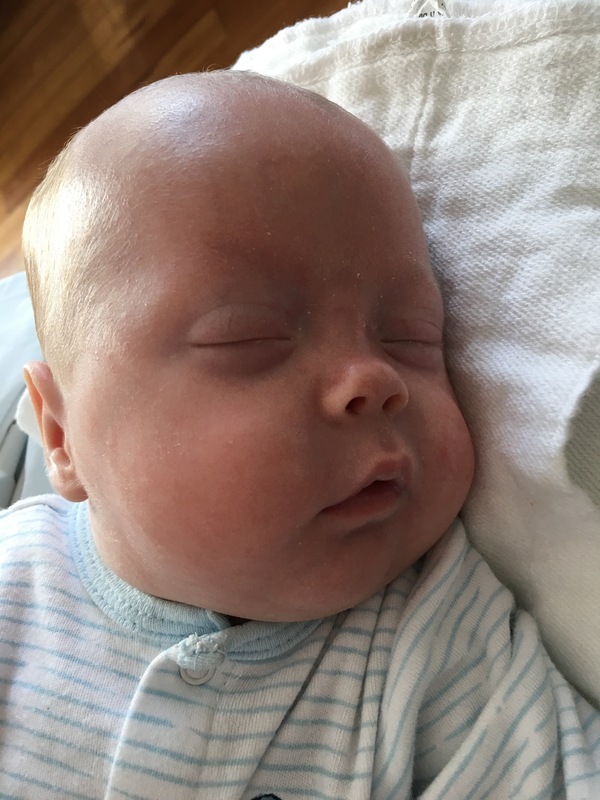 Milestones: As of August 1st we are off oxygen! Starting to do tummy time a few times per day. Sleeping: Still sleeps pretty well, but I think that has more to do with him spending all his energy trying to eat. Though I still have hope we got a good sleeper this time since Theo was horrible! Eating: The bane of my existence and obsession of every waking moment? In other words, we’re working on it. 65 ml of breastmilk plus 24 kcal of Neosure to fortify my milk, every three hours. Combination of breastfeeding and bottle feeding pumped milk (about 50/50 currently). Likes: Snuggling, being held. When he cries he calms down instantly when you pick him up. Dislikes: Gas, reflux, having his temperature taken and his NG tube. Tries to pull it out often and hates having it put back in. Mama: Still hating pumping. Still going into the office twice a week. It’s been hard to plan for things, knowing I’ll be out soon, but not knowing exactly when that will be. Starting to drop a bit below my pre-pregnancy weight, which is nice. I lost quite a bit of weight while breastfeeding T, but then gained it back, and then some, after I weaned. I’ll have to be more aware of that this time around. I’ve started losing my hair lately — I had completely forgotten about that fun postpartum side effect. When you’re pregnant you often stop losing hair (which is why pregnant women usually have great hair), but then a couple months postpartum you lose all that hair you should have been gradually losing during pregnancy. The human body is weird. Yesterday during barre I kept having that sensation that a hair was tickling my arms and I must have pulled about 10 strands of hairs off myself throughout an hour long class. At this rate I’m expecting to be completely bald in a few weeks.